Have you ever visited a national park and were just blown away by the magnificence of the mountainous cliffs and landscape views? I visited Yosemite a few years back with my parents and it’s an experience I’ll never forget. The sheer gargantuan size of the mountains blew me away. One of the waterfalls we walked up to was the most powerful I’d ever seen and I still remember the delicate spray blasting into my face and making a mess out of my hair. For me, Hoomaluhia botanical garden is my Yosemite in Hawaii. The Windward side of the island gets quite a bit of rain so the mountains are always a blend of rich greens that will make your eyes pop. It’s so easy to spend the day here enjoying the view – I hope Hoomaluhia gives you the same sense of wonder as it does me. 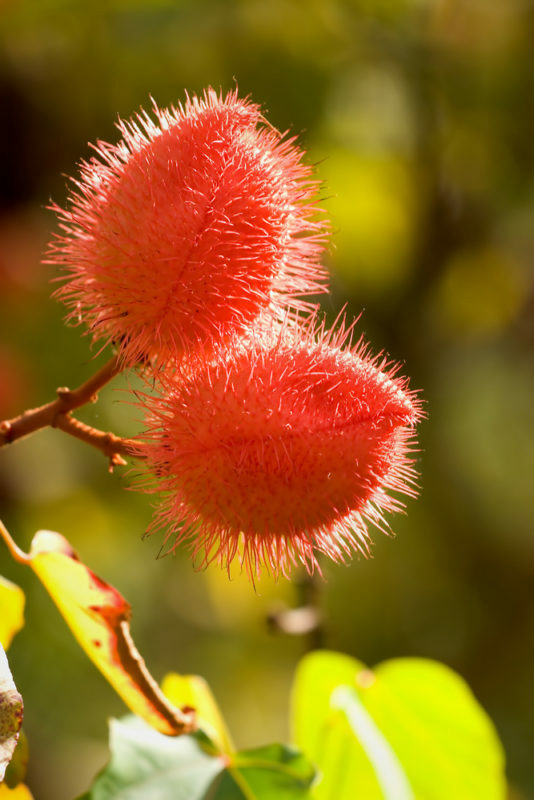 Driving Through Hoomaluhia Botanical Garden On A Rainy Day May Just Give You The Shivers. If you time it just right, the view you’ll get of the Koolau mountain range is heavenly. Of course, everyone always hopes for sunny and clear skies – that deep blue sky backdrop behind emerald green mountains is pretty difficult to beat. And it makes for an incredibly rare photo since grey clouds heavy with rain are almost always hovering. But don’t be too bummed if it’s raining – in fact, I think you my want to rush on over to Hoomaluhia if there’s been heavy rain for the past few days. On days where the rain flow is heavy, you’ll see a beautiful white waterfall between each vertical ridge. Over time, the constant rainfall has created a number of waterfalls all along the length of the Koolau mountains. If that’s not a heavenly sight, I’m not sure what is! Driving thru Hoomaluhia Botanical Garden with several waterfalls on the Koolau mountains. 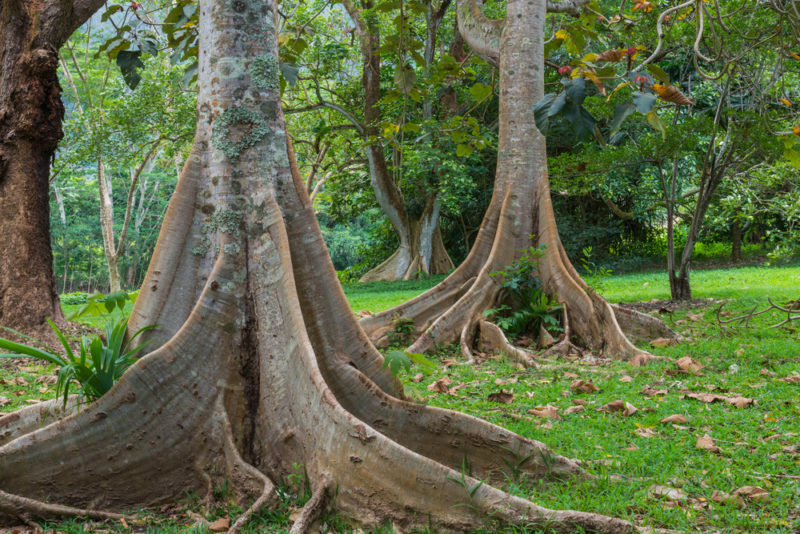 Getting to Hoomaluhia botanical garden is pretty easy. Just plug it into your GPS and the directions will take you right up to the gate. The entrance is actually at the end of a residential road so don’t second guess yourself if all you see are homes. There’s a small security office there, but the guard is usually standing or sitting outside. They’ll stop you and ask how many people are in your car – and will often peek inside just to make sure there’s no funny business going on (personally I think they’re checking for dogs which are absolutely not allowed here). Checking in will only take a few seconds and admission is completely free. 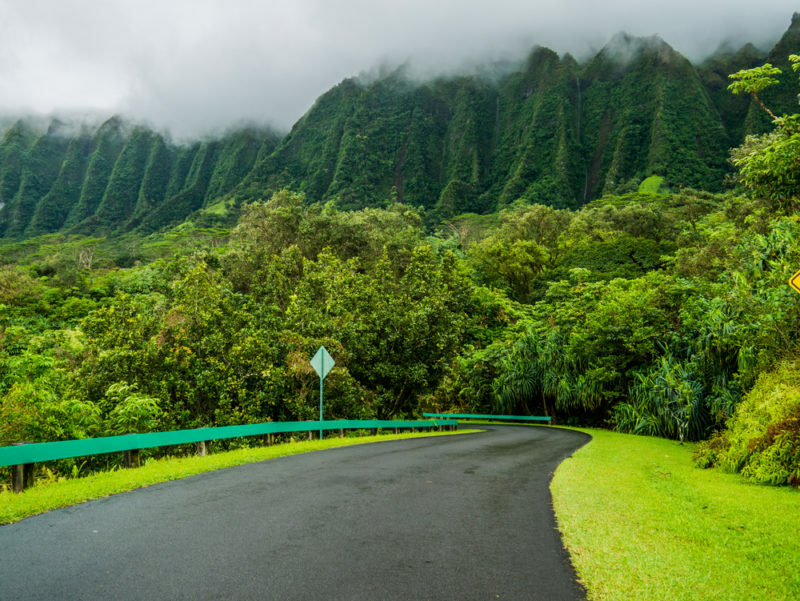 There will be a long straight road lined with palm trees and a fantastic view with the Koolau mountains. Unfortunately, if you stop your car here, you will get yelled at and chased off (I can speak from experience at least twice). Local Tip: If you’re really wanting that picture, park your car just outside of the security gate (there are a couple of designated parking spots) and walk in to get your shot. The first parking area you’ll run into will be the Visitor Center for Hoomaluhia. This is a neat gem of a place to get a good base of where you are, the activities available and what you’ll be able to see as you walk or drive your way through the garden. Don’t miss the main office where you can get your questions answered and get brochures and pamphlets that you can read for more info. Local Tip: You can do some fishing while you’re here (on the weekends). It takes 20 minutes to walk down to the lake from the Visitor Center, but it’s a lot of fun especially if you’ve come with kids. The poles are free to borrow (first come, first served) and you’ll have to bring you own bait. Ashley took her 2 and 4-year old children to Hoomaluhia for some fishing – this is how their day went. 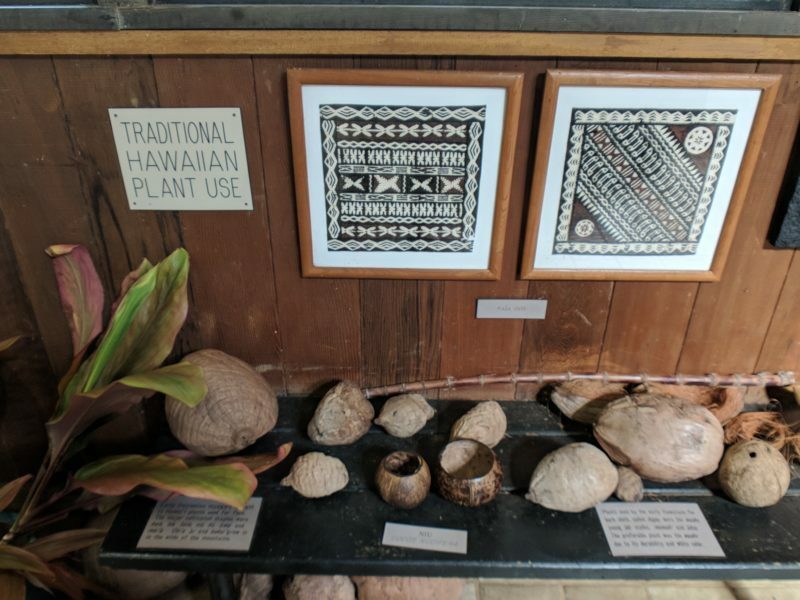 A mini museum showcasing how Hawaiians used plants for everyday use. I don’t know about you, but I love to just sit back, relax and stare when I’ve got this beautiful a view in front of me. How can you beat being in Hawaii and seeing this? This particular spot is at the very end of the park and these benches are often empty. Local Tip: If it gets too hot, there’s a pavilion right behind me with plenty of benches and picnic tables where you can enjoy the view under some shade. It’s also a great place to get some work done on your laptop! A view of the Koolau mountain range. Driving will only take you about 5 – 10 minutes from end to end (this is completely dependent on how many times you’re tempted to stop along the way), but walking will take a good hour each way at least. There are several parking lots along the way with bathrooms and small trails leading to camping grounds. Most of the trees and plants are labeled so you may just find yourself wandering off to discover more greenery. Local Tip: Birdwatching is an awesome activity at Hoomaluhia. 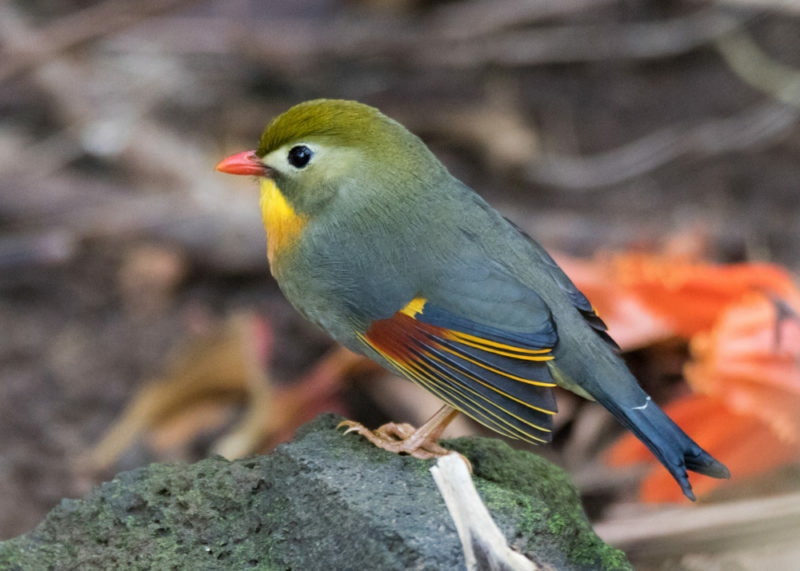 Many of the birds here can only be found on lesser known rainforest trails, but due to the immense size of Hoomaluhia, there’s enough room here for them to flourish. Red-billed leiothrix aka Japanese hill robin. If you’re on a tight budget or just want to wake up in a rain forest instead of Waikiki, consider spending a few days camping at Hoomaluhia. You can only camp here Friday thru Monday, but 3 nights and 4 days is more than enough time to enjoy the view and save some cash. There are no campgrounds available on Wednesdays and Thursdays on Oahu, so plan your camping trip accordingly to avoid these days. 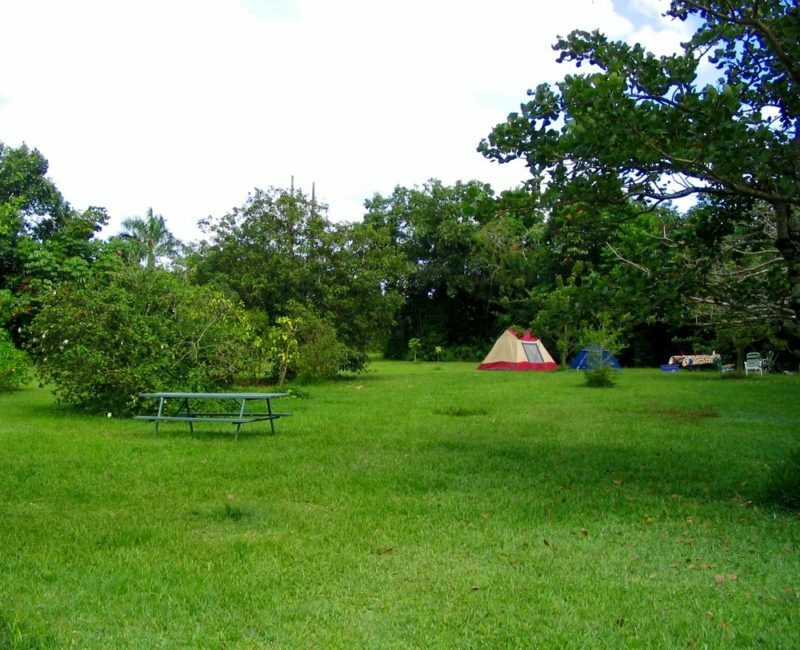 Local Tip: Oahu has 3-day and 5-day camping grounds that only cost $32 and $52 respectively. Check the list and reserve your campgrounds. Believe it or not, Hoomaluhia is a beautiful place to have a casual wedding or wedding reception. 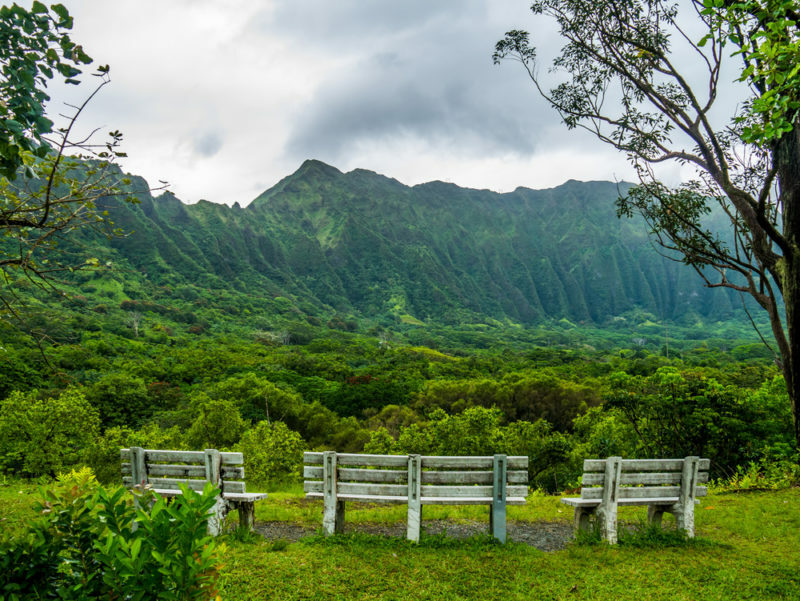 Their camping grounds and pavilions for larger groups are exceptional and the view of the Koolau mountains is difficult to beat. Plus, it’s free! The permit, parking and reservation won’t cost you a dime. But, it is required to meet up with the Hoomaluhia staff in person, which is a bummer for those who don’t have a Hawaii contact or wedding planner. 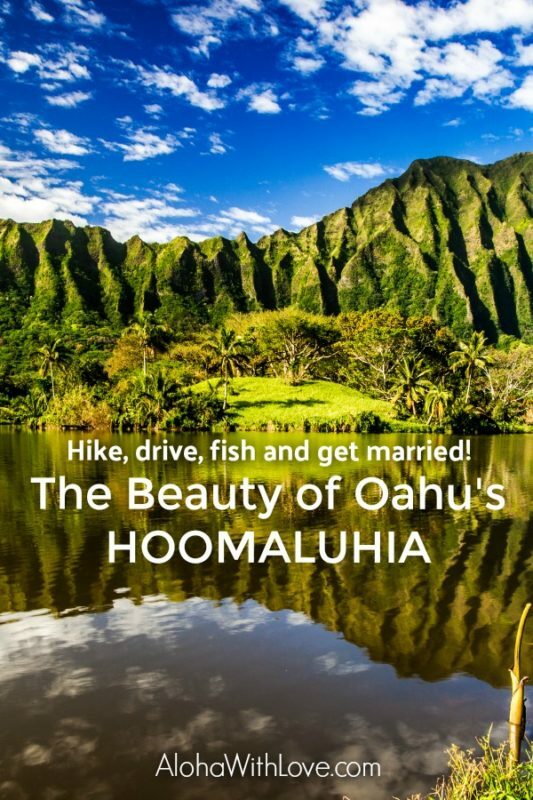 The Wedding Spot has a great info article on getting married at Hoomaluhia. Let’s talk! Hoomaluhia is a fantastic gem that most people miss on their Oahu vacation. Have you visited this wonderland before? Let me know what you think below so I can help you and everyone else make your Hawaii vacation an awesome one!